The Deschutes Tier of the Oregon Timber Trail showcases both the volcano-rich atmosphere on the east flank of the Cascades and the dry high-desert environment of Central Oregon. This trip gives you the chance to string together alpine lakes like links in a bike chain — as you skirt the shores and quite possibly stop for a dip in the crystal-clear waters. Bend is not a secret destination these days – instead, it’s a vibrant and popular place with every amenity for the intrepid adventurer. This is a city where it feels like everyone gets outside and does something active every day. There’s an astonishing amount of backcountry play available within a 20-mile radius. It can serve as the perfect hub for a quick weekend trip (or better yet, midweek) to explore the Deschutes Tier of the Oregon Timber Trail. Stretch your trip out, because it will be a very long time before you run out of good places to ride and recreate. 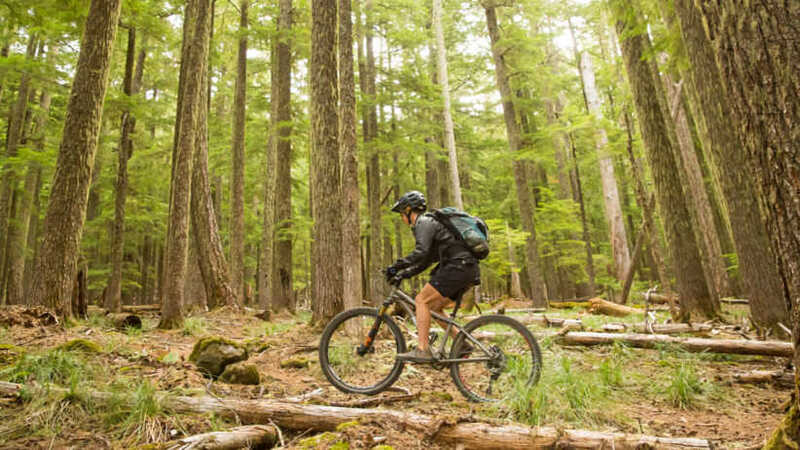 Ease into your two-wheeled adventure with a bucolic 12-mile ride that connects three picturesque alpine lakes. Starting on the shore of Cultus Lake, head out around the lake to the more sheltered and untrammeled north end, where you’ll find lakeshore access. Keep in mind that Cultus Lake is very popular in the summer, and you’ll find more solitude further down the route. Once you’ve got your groove on, crank up to Deer Lake, a tiny water body dotting the shadow of modest Cultus Mountain. This lake is more likely to be all yours, so take some time to explore and envision a future vacation home on a lake. From Deer Lake, drop down slightly to Little Cultus Lake, another less-trafficked body of water where you can immerse yourself in the melodic sound of birds, the tangy smell of pine and the deeply relaxing sense of natural space. You might want to note the secluded campground on the east side of Little Cultus – you might be coming back here for another piece of adventure. You can turn around and make this an out-and-back, or glide down a gravel road to make a loop back to where you started. You got a taste of this terrain; now it’s time to step it up a little. This lollipop route extends your time on the bike, covering 19 miles, and includes some legit climbing. 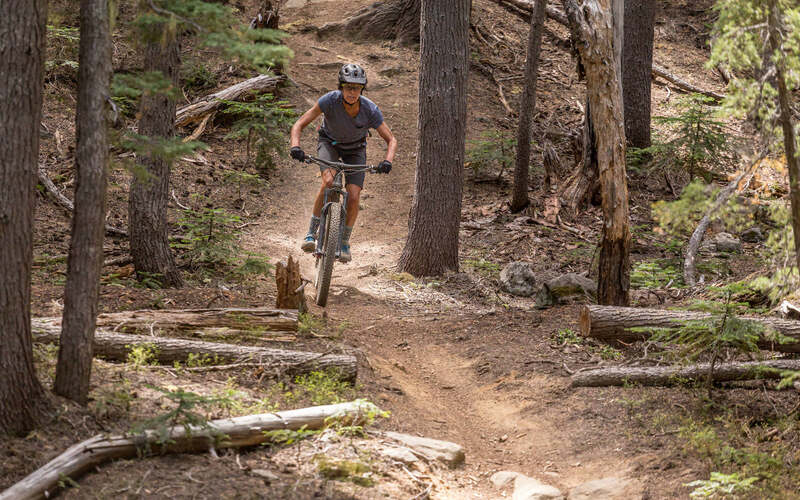 From the campground you rolled by on the first segment, head for the singletrack Lemish Lake Trail and ascend a thousand feet over the next 7-8 miles. It’s not all climb; you’ll get a bit of roller-coaster as you gradually go higher. Along the way you’ll go by Lemish lake, roll through lush meadows and notice that the trees around you are getting taller. Pass by numerous craggy rock formations that muscle their way up through the forest, eventually topping out around 11 miles in at a majestic point above Charlton lake. Drop down to the lake shore. This is definitely a time for a pause to refuel and relax, because the wild (well, wildly fun) part of the ride is yet to come. The downhill ride back treats you to rock gardens, flowy switchbacks and as much speed as you desire. Bend might be the metropolis of Central Oregon, but Sisters is a smaller, funkier outpost that offers its own take on Western hospitality. This segment starts just outside Sisters, which will give you even more options for food, drink and fun on this trip. It’ll be the crowning achievement of this trip, a challenging 27-mile opportunity to test yourself in the midst of Cascade volcanoes. From the Whychus Creek Overlook Trailhead south of town, get your heart racing with a 12-mile ascent on a little-used dirt backroad that takes you up to popular Three Creeks Lake. When you arrive, be sure to take pride in how you got there; no car and paved road for you! Grab a drink and snack at the store and get ready for a well-deserved reward. The ride back down is a smorgasbord of riding-induced euphoria – the test of this ride isn’t just the climb. 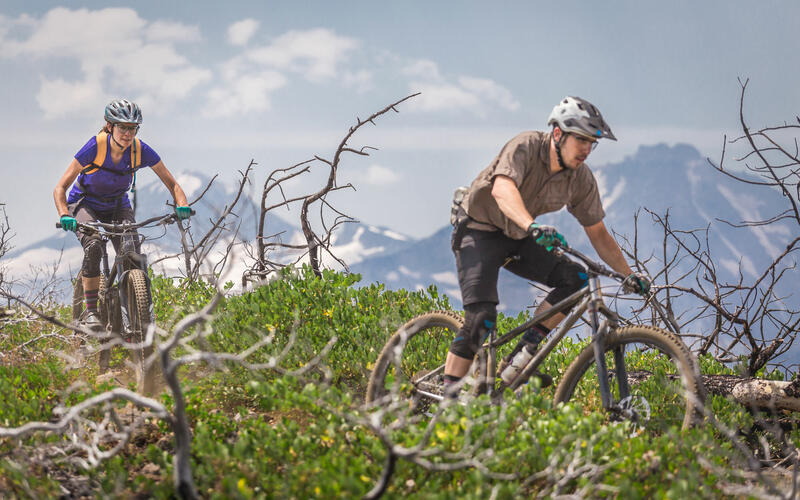 Loose and technical trail sections, stream crossings, small logs to bunny-hop, vertical turns and drops, brief climbs to punctuate the flow, and finally some sweeping turns to bring your adrenaline level back down a bit. All this through a visually arresting environment of snowy peaks, wildflowers, wildfire-charred trees and sparkling streams. It’ll be hard to decide what was the best part of this ride. 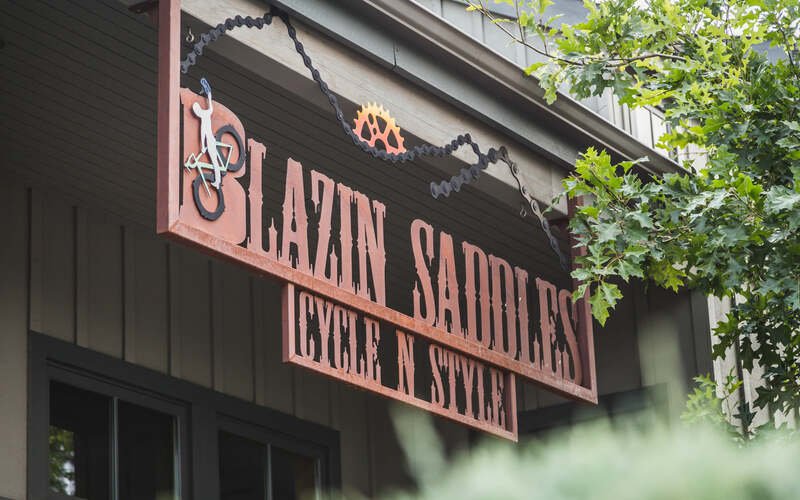 It’s hard to single out lodging, restaurants and bike shops, because there are so many options in this area. Suffice to say you won’t lack for choices in any element of your trip, but here are a few favorites. In Bend: Start at Crow’s Feet Commons, part café, part bike-and-ski shop, part tap room and overall awesome community gathering place. Also take note of Sunnyside Sports bike shop, The Sparrow Bakery, Thump Coffee, Spork, Parrilla Grill and Crux Fermentation Project. In Sisters: Sisters Coffee Co., Angeline’s Bakery, Three Creeks Brewing, Blazin Saddles Bike Shop, Melvin’s Market and the Sno-Cap Drive-In. 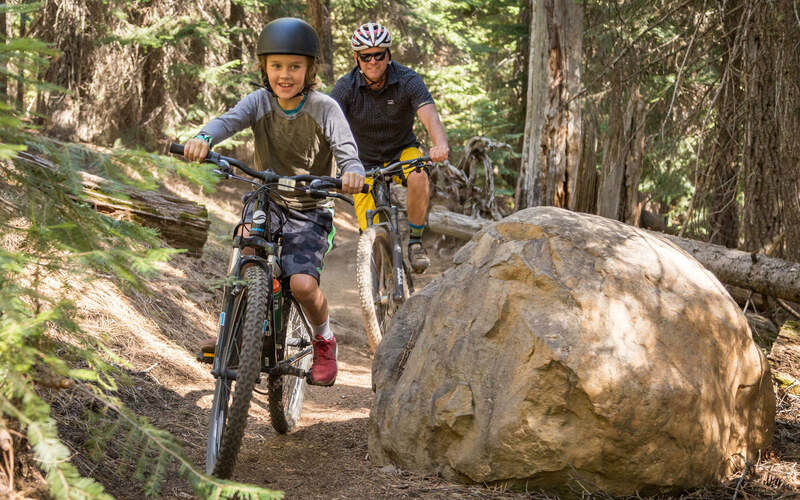 As far as other riding options, both Bend (Phil’s Trail Complex) and Sisters (Peterson Ridge Trail System) have excellent options for trail-riding right in or near town.